hash (getting from hash(key.hashCode())) is used to find the bucket location at which the Entry object is stored . 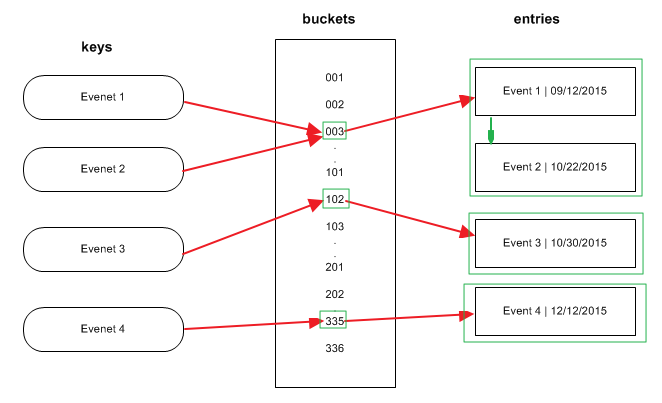 Entry object stores in the bucket like this (hash,key,value,bucketindex) . How to avoid the conflict hash code ( for example, key 1 and key 2 might have the same hashcode), both records will be saved in the bucket as a linked list (two entries). When we want to receive the value for key2, it will get the bucket which has two entries in the list. we traverse through linked list , comparing keys in each entries using keys.equals() until it return true. Then the corresponding entry object Value is returned . 4. more than one key have the same hash value, Entry objects are stored as a linked-list with in a same bucket. With in a bucket values are stored as Entry objects which contain both key and value. This entry was posted in Java by James. Bookmark the permalink.